This photo still makes my heart go pitter-patter every time I see it. The collection of things, organization and pretty colors together are perfection! So pretty! I would love to see that in my office for storage! Thanks for the pic! It's the first time I've seen it! Do you know what issue it was in? I've been having problems getting my hands on Canadian House and Home. They never have it at my local bookstores!!! I hate that I can't get my hands on that mag here. I've looked everywhere... and to get a subscription in the US was over $50. Love those green boxes! And, I have oodles of baskets that I need to use... great idea. So much stuff layered in such a small area, but it works without looking messy! oh love it!! so so functional!! love those organized stacks!! Hi LindsB!! So nice to see you again! I remember you popped over early in my blog life;) and said your parents lived in NH! Your blog is great! In answer to your question it was 'Fairground Antiques' in Swanzey. It's a real dive of a place, but we can find some great finds there! It's just south of Keene... and the to-die-for pancakes are about a mile down the road at The Swanzey Diner!! Gotta love the small towns in NH!! for the love of god that's awesome! I love those woven baskets! 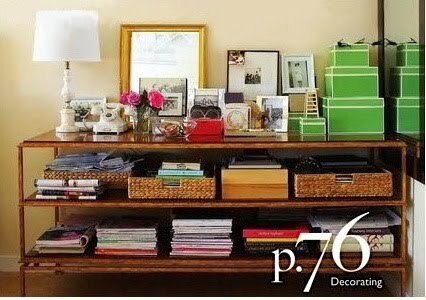 This pic gives me hope that "clutter" can look cool. Yummy. Love the perfect stacks and the green boxes. Love the cluttered look of it without it looking messy. I love the green boxes. Sorry I've been MIA for the last couple of weeks. I love seeing all of the pics of your Halloween party, you did an amazing job. lucky me living in toronto i buy house and home every month :) but somehow i missed this image - i love it! just my style.. When I saw Jenny's (LGN) post about her boxes a few weeks ago I started hankering to make some of my own. Now here they are, just as I envisioned mine! Want them...need them! I must find a source to pick up this fab mag. I keep seeing amazing pics from it! me too, me too! Those green boxes, the woven boxes, the gilded mirror, and the flowers... love it!